Vladimir Putin. Photo: Sean Gallup/Getty Images. Tensions between Russia and Ukraine have spiked after Russia fire upon and seized Ukrainian ships on Sunday in the Black Sea. Russia’s military presence in the Black Sea region has increased since the 2014 annexation of Crimea, and Moscow has made similar moves elsewhere. Russian capabilities present specific challenges to NATO – something the alliance is well aware of. A confrontation between Russian and Ukrainian ships in the Black Sea this weekend ended with Ukraine’s ships seized and its sailors jailed. It was the first direct clash between Moscow and Kiev in years, and it stoked tensions that have been elevated for years, especially after Russia intervened in Ukraine in 2014 and seized the Crimean Peninsula and then backed separatist movements along Ukraine’s eastern border. The November 25 clash took place in the Kerch Strait, which divides Crimea and mainland Russia and connects the Black Sea to the Sea of Azov. Photos show Russia appears to have struck one of the Ukrainian ships with a heavy weapon, such as a 30mm gun or missile. Since claiming Crimea, Russia has taken a more aggressive stance toward the Sea of Azov, declaring invalid a 2003 agreement in which Moscow and Kiev agreed to share the body of water. In 2015, Russia began construction of a bridge over the Kerch Strait. The sea is already the world’s shallowest, no deeper than 50 feet, and the height of the bridge further restricted the size of ships that could pass through. Russia has also interfered with Ukrainian shipping in the area and at times closed the strait completely – all of which is particularly challenging for Ukraine, which has major ports on the Sea of Azov. Ukraine and Russia have both pursued a military buildup in the area, but Russia has more forces and their activity has been more substantial. Moscow’s moves in the Black Sea region are of a piece of with what it’s been doing throughout Eastern Europe amid heightened tensions with NATO. Since 2014, Russia has “built up tremendous amounts of capability” in Crimea, said Omar Lamrani, a senior military analyst at geopolitical-analysis firm Stratfor. Google MapsTensions between Ukraine and Russia have been high since 2014, and NATO has taken a more active role in the region. 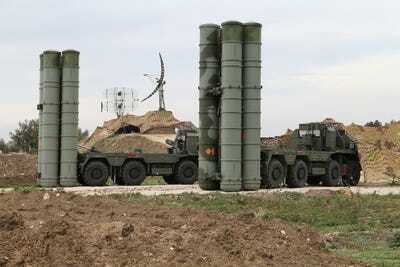 “They have now three battalions of S-400s, plus other air-defence systems, like the S-300 [and the] Buk M2,” Lamrani said. Another division of S-400 missiles is on its way to Crimea, where it will be the fourth on duty, according to Russian state media. “They installed a number of coastal missile-defence batteries” firing weapons like Bastion and Bal cruise missiles, which can strike land and sea targets, Lamrani said. 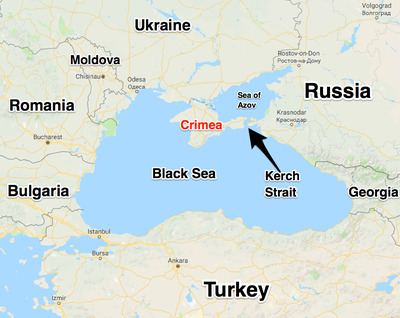 Russian state media also said this week that more Bal and other anti-ship missiles were headed to the Crimean city of Kerch, which overlooks the strait of the same name. Russia sees Crimea as a stronghold from which to pressure Ukraine and assert control over a broader swath of the Black Sea, Lamrani said. Weapons like the S-400 and coastal-defence systems can be employed as a part of anti-access/area-denial, or A2/AD, strategy, and their presence in Crimea and elsewhere along Russia’s eastern frontiers has garnered attention from NATO. Russian “A2/AD capability [runs] from the high north through Kaliningrad, down to Crimea and all the way down into [Russia’s] base at Tartus in Syria,” Ben Hodges, who commanded the US Army in Europe before retiring at the end of 2017, told Business Insider at the beginning of November. The S-400, considered Russia’s most advanced air-defence system, is also deployed in Kaliningrad on the Baltic Sea and near Latakia on the Syrian coast. The S-300, which is older but still highly capable, has been deployed in the region, including in the breakaway Georgian province of Abkhazia, which borders the Black Sea. Russian Defence MinistryRussia S-400 air-defence systems in Syria. Russian moves around the Black Sea were particularly worrisome, Hodges said, comparing the seizure of Crimea and subsequent territorial claims in the Black Sea to China’s claims and island construction in the South China Sea. Some of the NATO members bordering the sea, like Romania and Bulgaria, don’t have a major naval presence there, but Turkey would likely prevent Russia from having free reign in the sea. With the vantage point provided by Crimea, Russian combat aircraft and land-based weapons systems like the S-400 and Bal missiles can extend their reach hundreds of miles into and over the Black Sea. 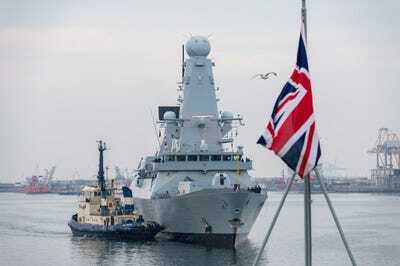 “They can effectively support their navy with an umbrella defence of surface-to-air missiles and anti-ship missile systems that can keep NATO away in case of any threat,” Lamrani said. A2/AD systems could provide similar defence in a place like Kaliningrad, which has Russia’s only year-round, ice-free Baltic Sea port and is close to St. Petersburg, Russia’s second-largest city. In western Syria, where Russian S-400 systems have already been deployed, US-led coalition forces have worked hard to avoid Russian airspace. 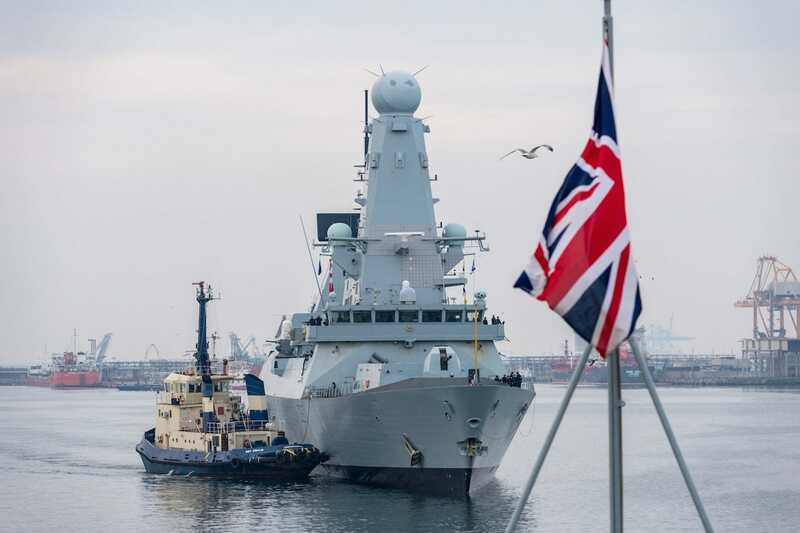 NATO/CPO FRA C.ValverdeStanding NATO Maritime Group Two (SNMG2) flagship HMS Duncan, arrives to the harbour in Constanta, Romania, February 2, 2018. Russian forces are outstripped by NATO as a whole, and an all-out Russian attack on another country is considered unlikely. But concern has grown that Russian A2/AD in areas like eastern Syria or the Baltic and Black seas could create layered defensive bubbles and limit NATO’s freedom of movement – especially in an engagement below the threshold of war. “There’s been decline in … investments rather in this type of warfare, as NATO attention has shifted to other priorities,” Lamrani said of A2/AD. But, he noted, Russia has pursued the mismatch to compensate for a weakness. Advanced stealth platforms, like the US-made F-35 Joint Strike Fighter, are seen as potential counters to A2/AD systems. And other assets, like the Navy’s EA-18G Growler electronic-attack aircraft, could help thwart them. But it’s not clear those resources are available in the numbers needed to do so, nor is it likely such an engagement could be conducted without heavy losses.